Update 12/14/14: This article has been updated to reflect new information from an anonymous art collective claiming responsibility for the effigies and from a statement by the chancellor and the executive vice chancellor and provost. Effigies of black figures suspended in what resembled a lynching hung from Sather Gate and other locations on campus Saturday morning. About 9 a.m., UCPD received reports of an effigy hanging from Sather Gate and removed two such effigies, according to Claire Holmes, associate vice chancellor for communications and public affairs. The clothing in one of the cutout images read, “I can’t breathe,” a reference to the last words of Eric Garner, an unarmed black man who died after a police officer put him in an apparent chokehold. Another cutout depicted Laura Nelson, a black woman who was kidnapped and lynched with her son in 1911 in Oklahoma. On Sunday, a Bay Area collective of artists released a statement taking responsibility for the installation of the effigies. The group identified itself as AnonArt Oakland and described its members as consisting of queer and black members. According to the statement, the group intended the project to be in “unambiguous alignment” with the affirmation of black lives and apologized for the disturbance it caused. The statement emphasized that the images of historical lynchings remain relevant today, as the recent deaths of black men, such as Garner, illustrate the consequences of systemic racism. The statement comes after campus administrators and police urged the entity responsible for the effigies to come forward. 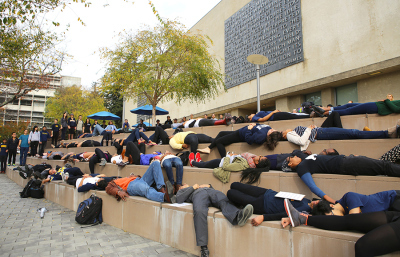 Zaynab AbdulQadir, a UC Berkeley freshman and intern at the Black Student Union, said she first saw a photo of the effigies and immediately left her residence hall to see them herself, later helping to remove a third figure located down Bancroft Way. “It’s a numbing feeling of shock and disbelief,” AbdulQadir said about how she felt upon seeing the figures. UCPD said Saturday that police were investigating the incident as a hate crime or a crime based on racial bias. The incident comes in the midst of ongoing protests in Berkeley and around the Bay Area against recent grand jury decisions in the deaths of Garner and Michael Brown, a black man who was shot by a white officer. Another rally began at noon Saturday at Bancroft Way and Telegraph Avenue. “We must all be vigilant to ensure that we are creating a campus environment that allows for the free exchange of ideas and doesn’t frighten or intimidate people,” the email read. Staff member Ariel Hayat and staff writer Arielle Swedback contributed to this report. Contact name Melissa Wen and Heyun Jeong at [email protected].